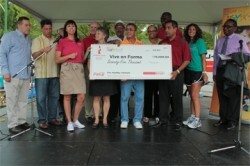 Underscoring a broad commitment to health and wellness, The Coca-Cola Foundation, the company’s philanthropic arm, has awarded Chicago-based Vive en Forma with a $75,000 community grant. Vive en Forma is a non-profit organization and its mission is to help Latinos and African-Americans embrace a healthier lifestyle and live life in shape. A formal grant check was presented at the 18th Annual State Senator William Delgado “All Kids and Family Health Fair” located at Mozart Park, 3840 W. Armitage Ave. on Friday, Aug. 5. © 0648 Chicago Hispanic Newspaper, Lawndale News, Hispanic Bilingual Newspapers, Su Noticiero Bilingue. All rights reserved. XHTML / CSS Valid.